Chrysler invented the minivan. Now they're using it to try weaseling more money from the government by applying for a loan to give the post office a fleet of electric Town & Country minivans. Progress! The loan wouldn't actually be used to produce vehicles Chrysler would be able to sell, but rather to create a nationwide demo fleet of all-electric minivans for the Post Office. Taxpayer money to pay for the marketing of a product Chrysler is unable to bring to market? That's almost as good an idea as trusting the post office with a fragile package. Chrysler invented the minivan 25 years ago. More than 12 million minivan sales later, Chrysler today showed off four all-electric Chrysler Town & Country minivan concepts to the U.S. Postal Service (USPS) as part of the USPS Earth Day celebration. Chrysler LLC, in conjunction with the USPS and select energy service providers, also announced that the company intends to apply for the U.S. Department of Energy's (DoE) Transportation Electrification stimulus program for a federal grant, which would enable Chrysler to establish a nationwide demonstration fleet of zero-emission electric minivans that could be used by the U.S. Postal Service for mail delivery. "With more than a 40 percent market share, our Chrysler and Dodge minivans continue to lead the segment we created more than 25 years ago," said Frank Klegon, Executive Vice President-Product Development, Chrysler LLC. "Our ENVI electric minivan concepts illustrate Chrysler's innovation with electric vehicle technology and show what the future could hold." Chrysler's ENVI group leveraged the flexibility of its electric-vehicle strategy to demonstrate an all-electric version of its best-selling minivan. These electric minivan concepts are targeted specifically for use by the U.S. Postal Service for mail delivery. "We continue to look for energy-efficient replacement vehicles for our aging fleet as we explore ways to reduce our transportation-related carbon emissions," said Sam Pulcrano, Vice President-Sustainability, U.S. Postal Service. 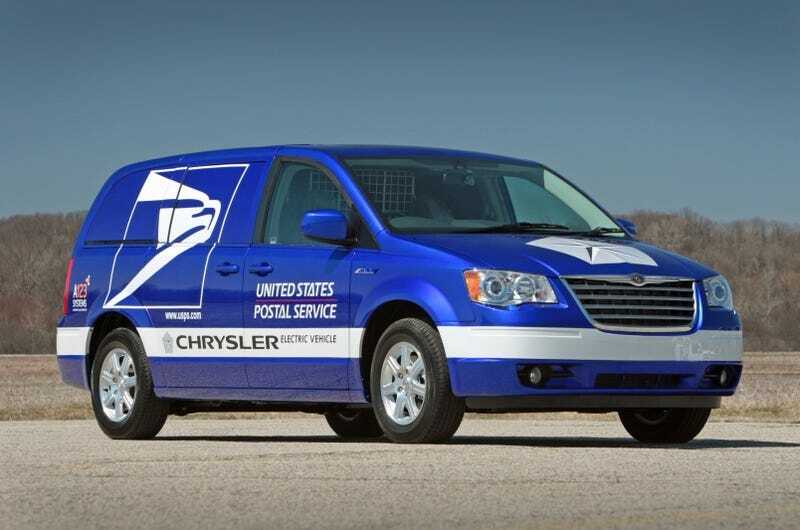 "Chrysler and the Postal Service have an established relationship as there are more than 10,000 of our minivans in the Postal Service fleet," said Lou Rhodes, Vice President-Advance Vehicle Engineering and President of ENVI, Chrysler LLC. "The Postal Service is a recognized environmental innovator and leader, and we are excited at the prospect of continuing our relationship by working to deliver alternative energy postal delivery vehicles in the future." "Our partnership is structured to easily expand into additional regions of the country as the scope of the project increases," added Rhodes. Earlier this month, Chrysler announced A123Systems as one of its strategic partners and production battery supplier for the company's initial production electric vehicles. Chrysler LLC and A123Systems signed an agreement stating that A123Systems will supply energy storage systems for Chrysler's first-generation ENVI Range-extended Electric Vehicles and battery-only Electric Vehicles. Based in Watertown, Massachusetts, A123Systems has announced plans for a Michigan-based production facility. A123Systems will manufacture Nanophosphate Lithium ion prismatic battery cells, modules and battery packs for Chrysler LLC. Advanced lithium-ion battery chemistry has the capability of meeting consumer demands for performance, driving range and durability.